Did you know that this is Children’s Book Week? It’s happening right now! I’ve enjoyed far too many children’s books to list them all here, but I want to hear about your favorites. Comment with your favorite children’s book at Jess Smart Smiley for a chance to win a signed copy of “Rumpus on the Run”! 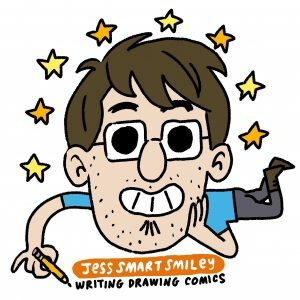 Get Free Comics – This Saturday! The first Saturday in May is upon us, which means…FREE COMIC BOOK DAY! Swing by Dragons Keep this Saturday for free comics. I will be drawing pictures and selling books at the Provo location from 10am-Noon. See you there! Click for a complete list of Free Comic Book Titles. FREE JAN & FEB CALENDARS! MONSTER LOOK & FIND…DRAWN BY YOU! You asked for it. Download the Rumpus pattern for your computer, phone or tablet here. Happy weekend, everyone! GET FREE COMICS THIS SATURDAY!